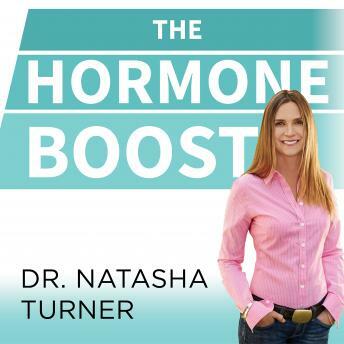 Dr. Natasha Turner's first book, The Hormone Diet, revealed hormonal imbalance as a cause of weight gain and a proven barrier to fat loss, and her second book, The Supercharged Hormone Diet, established Dr. Turner as an authority in the link between weight loss and hormones. The Hormone Boost is the next evolution in hormone science. There is widespread knowledge that your thyroid hormone can sabotage weight loss efforts, but this book reveals for the first time that five other hormones-testosterone, adiponectin, growth hormone, adrenalin, and glucagon-are equally critical when trying to lose weight. Within days of the initial twelve-day 'induction phase,' you will feel younger, lighter, and better than you have in years. Using the latest research, Dr. Turner offers a cutting-edge exercise plan, a supplement program, and weekly meal plans with corresponding recipes for each phase of the path to weight loss. The Hormone Boost also includes informative and inspiring case studies, making it a must-have for anyone looking to shed weight and feel revitalized.